Smithville Christian High School is an independent Christian school in the heart of the beautiful Niagara Region. Offering excellent, Christ-centred education to students in Grades 9 to 12, Smithville Christian is proud to be a place where students belong, believe and succeed. Smithville Christian is excited about the impact we are having in training kingdom citizens. Our school is a friendly, lively welcoming place, where students of all denominations and walks of life are impacted daily by the instruction and example of caring Christian teachers. Every day, in every class and extra-curricular activity, our students learn that our world belongs to God and that they have a role in shaping it for Christ. We work hand-in-hand with churches and families as we help students – academically, socially, emotionally and spiritually – to navigate the sometimes challenging teenage years and develop into mature, Christ-serving citizens, ready to have an impact in the world. With strong academics and a broad range of shop, apprenticeship and co-op options, we are able to provide an excellent Christ-centred education for all students – whether they are heading to university, college, training programs or the workforce. We also offer many sports, travel, dramatic, technological, artistic and musical opportunities that enrich the lives of students and our community. The environment at school is fun, friendly, inclusive and respectful, with strong leadership and modelling from staff on appropriate dress (uniforms) and behaviour, and our students and staff are happy to come to school each day. Smithville Christian High School is a member of Edvance Christian Schools Association and a member of Christian Schools International. This poster can be found at the entrances to our school and on the walls of every classroom and office. Belonging, believing and succeeding are things that we hold very dear, and this poster makes it clear what we're after when talk about these things. The poster is our effort to reflect and direct. We want what’s on this poster to both tell others and remind ourselves what kind of learning community we are. We also want the posters to stimulate us to continue to grow as a Christian high school that honours God and enables young people. accept others and celebrate their uniqueness - we will strive to bring diversity to the student body, we will teach and model acceptance, we will structure our classes so that uniqueness is embraced, we will employ strategies which allow different learning styles to thrive, and we will be intolerant of behaviours that limit acceptance. collaborate with other learners - we will structure learning situations where success is dependent on meaningful collaboration. extend the gift of hospitality - we will train students to receive guests in our school with bright engagement, and we will model this as teachers and staff on all occasions. yearn for wisdom - we will strive to integrate Biblical perspective in all subject areas and require our students to articulate or demonstrate understanding of that perspective. learn Christian discipleship - we will hold our students accountable to a high standard of conduct in school and at all school events, and we will employ restorative means for addressing contrary behaviours. worship meaningfully - we will plan chapel and devotional experiences which give students much opportunity to lead and join in vibrant worship. discern the value of cultural trends - we will train our students to have one foot in scripture and one foot in the world. demonstrate integrity - we will teach and reinforce the value of speaking the truth in love and walking the talk. greet learning opportunities with curiosity and awe - we will structure learning activities which entice vibrant learning, and we will not tolerate lack of engagement in our learners. lead and follow with a servant’s heart - we will structure learning that engages the needs of the world and reinforce our instruction with meaningful opportunities to lead and to serve inside and outside the school. shape culture - we will encourage learning which ignites passion and which yields quality products of lasting significance. plan for post-secondary success - we will structure a program which allows for a diversity of paths, and we will provide a strong Guidance program which engages students in frequent conversation and exploration of post-secondary possibilities. seek God’s calling - we will seek to know all students well, to engage them in an exploration of their God-given talents and passions, and to mentor them in discerning God’s calling in their lives. It is my sincere hope that when parents and students look at this poster, they will remember that we are a Christian high school that takes very seriously what we set out to do in the lives of our students. When teachers look at it, I am certain they will be reminded of every conversation we have had about the kind of school we intend to be and the kind of learning we intend to have happen here. 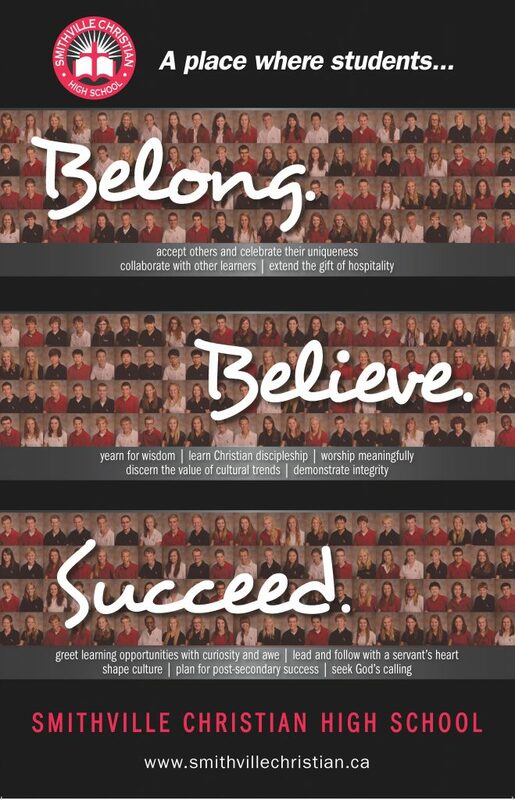 We welcome you to join the conversation about belonging, believing and succeeding.